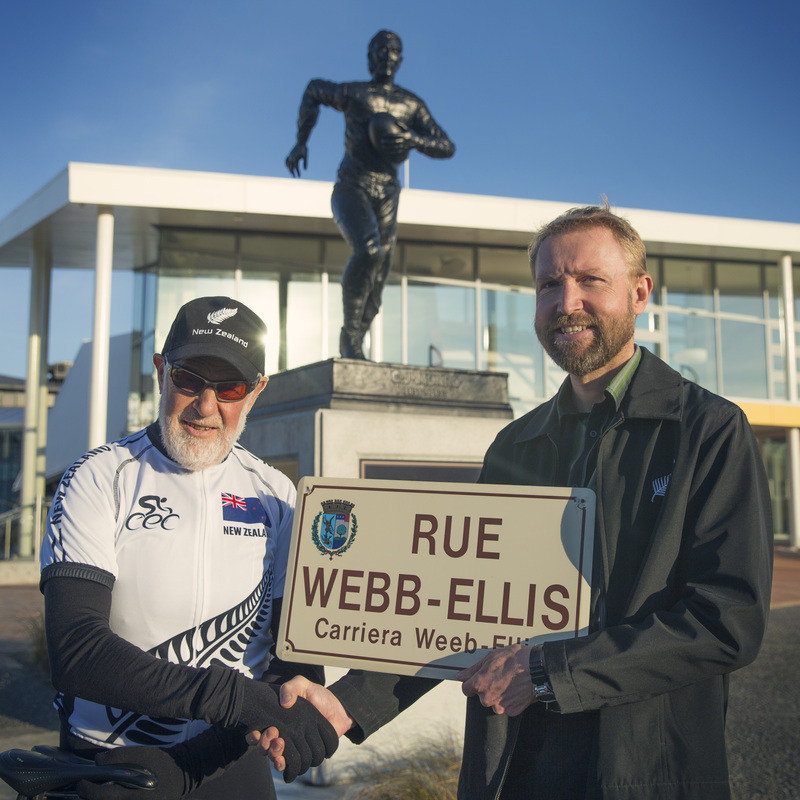 It was a superb winter’s day, the low afternoon sun shining on the city created a great backdrop for the handing over of the Rue Webb Ellis sign. 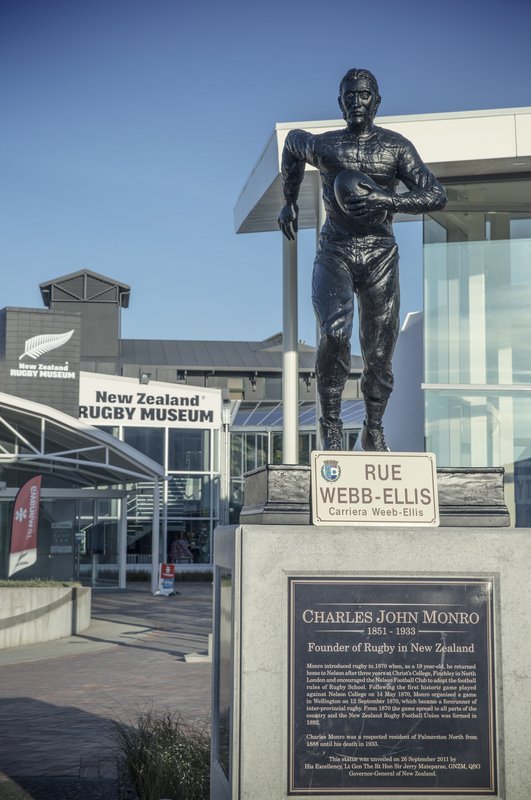 The Charles Monro statue set the scene, with the entrance to the New Zealand Rugby Museum in the distance. A number of supporters arrived: Palmerston North City Councillor’s, Adrian Broad and Grant Smith; Director of WholisticFitness, Holly Lynch; Director of the Volunteer Resource Centre Norelle Ward; Pedal Pushers Manager and fellow cyclist, Garry Buys; Grandson of Charles Monro and NZRM Treasurer, Neil Monro; a journalist and photographer from the Manawatu Standard; and several more. Pat Nolan arrived on his fantastically lightweight Merida Scultura road bike, dressed in his suitable cycling attire. The bike, and the neat black and white cycling jerseys donned by Pat and Garry, will be part of the uniform in France. We exchanged information with the journalist and posed for photos as the sign was passed over to Pat’s safe hands. 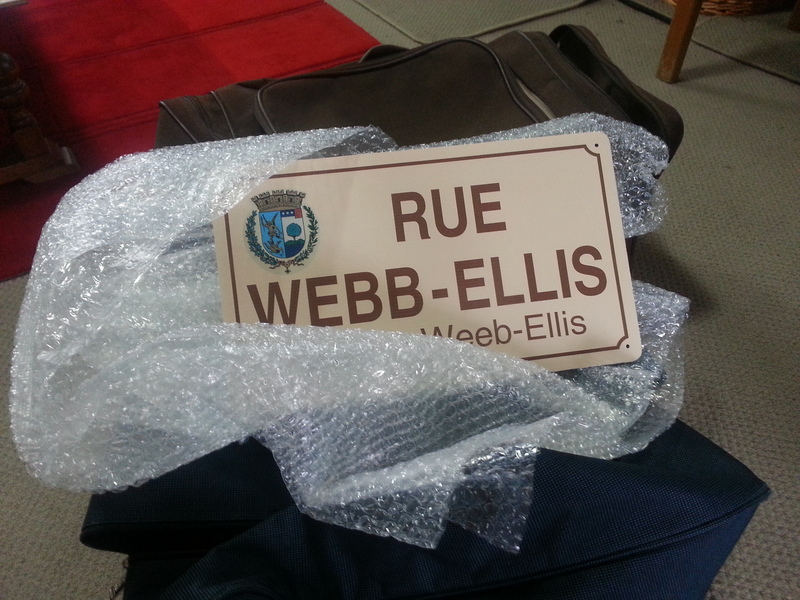 It looks like the sign will be a challenge to carry. This was the first time we had a bike and sign in one place, and although the sign is lightweight, its shape and stiffness will impede riders on long climbs. As a follow up to our story, the Manawatu Standard printed on Saturday the 7th of June. On Monday the 9th of June they also mentioned that Garry Buys has lost 14kg over the last couple of years as he has built up his training for the Tour De France ride. Pat was packed and ready to go the night before. 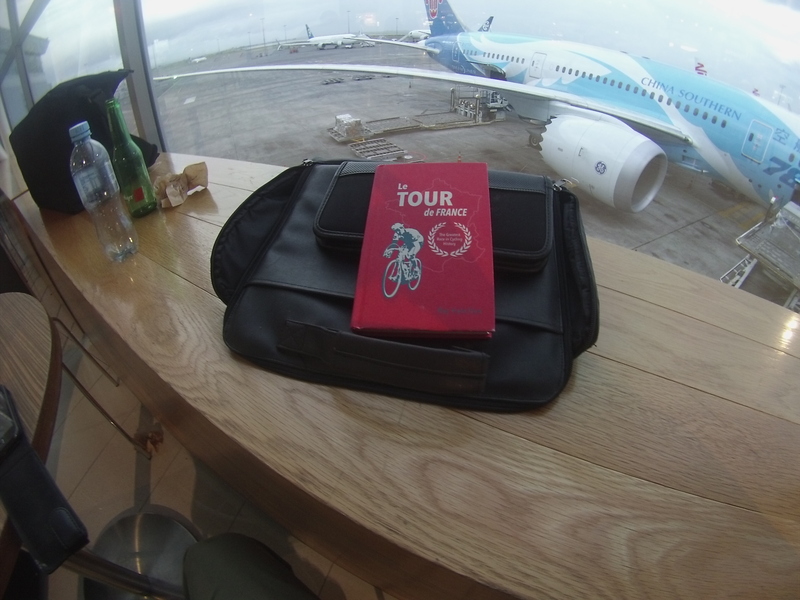 Everything was carefully weighed so as to ‘just’ fit within the weight limits – the bike at 20.8 kg, bag at 10kgs (exactly), and his carry-on luggage just under 7kgs. 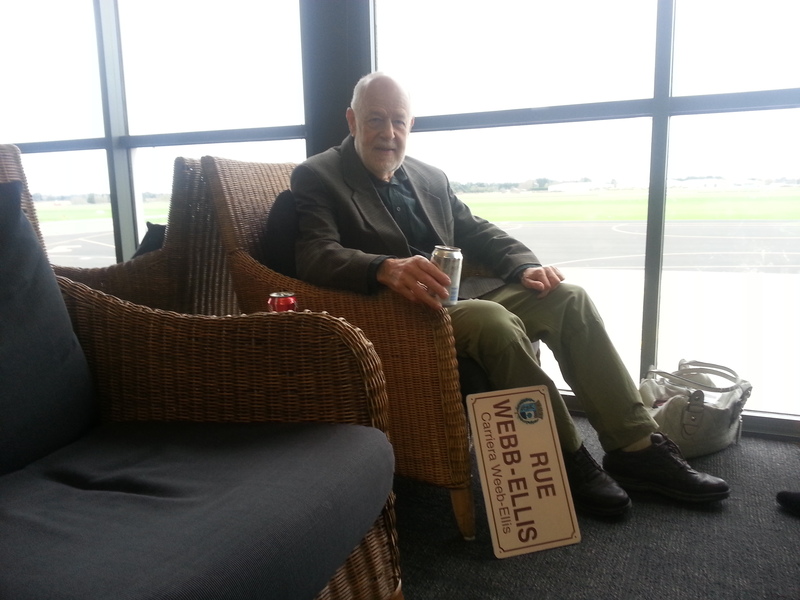 Suited up, and as charming as ever, the Air New Zealand ticketing agent gave him the pick of seats on the plane (signed him to for two seats just in case he changed his mind at the last minute) and gave him the code to the executive lounge. 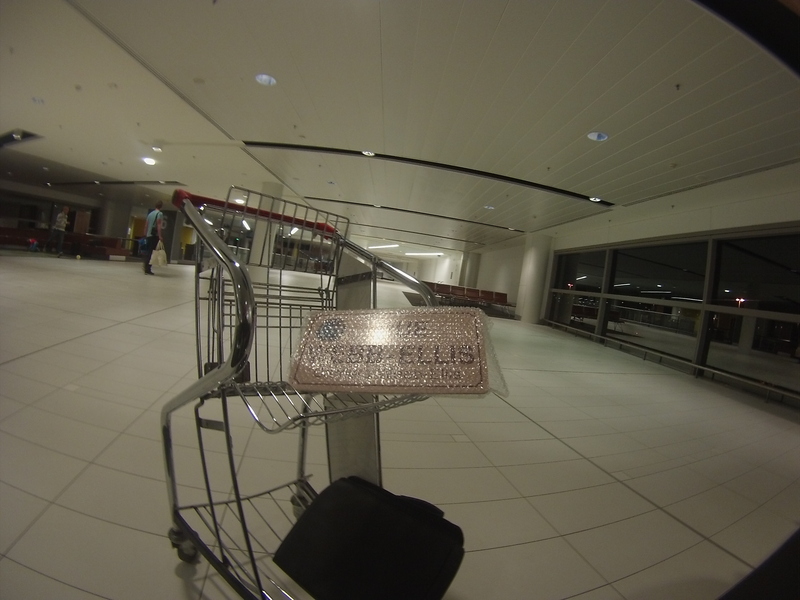 Pat arrived in Auckland an hour later where he met up with Garry Buys and hopped on their flight to Brisbane.. Arriving in Brisbane later that night to connect with their Dubai 13-hour flight. 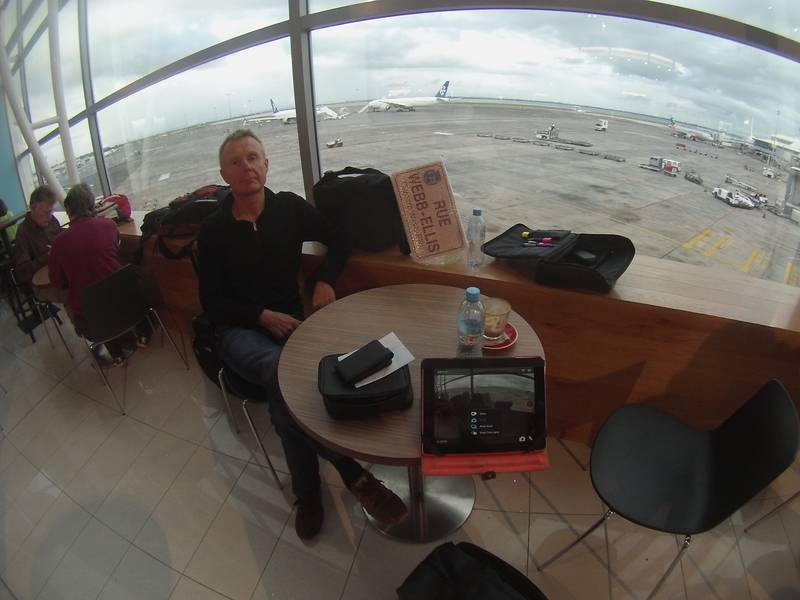 Dubai – over a Skype conversation with Pat today, he reported that the flight was hideous and had no sleep; and they were looking forward to hitting the hotel gym and pool. Pat promised to send us a note when he has arrived either in France, or when he is awake enough to put a couple of thoughts together. Thankfully, he has worked out how to use his iPad.